Archives of Eaton Bray News for May 2009. We have 12 gardens on display, most of which are opening for the first time. Do encourage friends and relatives to come and join in this lovely social event. To make the day a success we do need your help, especially in Eaton Bray Village Hall to sell tickets, help with refreshments, sell plants and raffle rickets. Donations of plants would be gratefully received. If you can help, please contact Gordon Gray or Kay Griffiths. If you do help, you needn't miss the gardens - a tour will be arranged for early evening, Tuesday 16 June, for helpers and those who have opened their gardens. 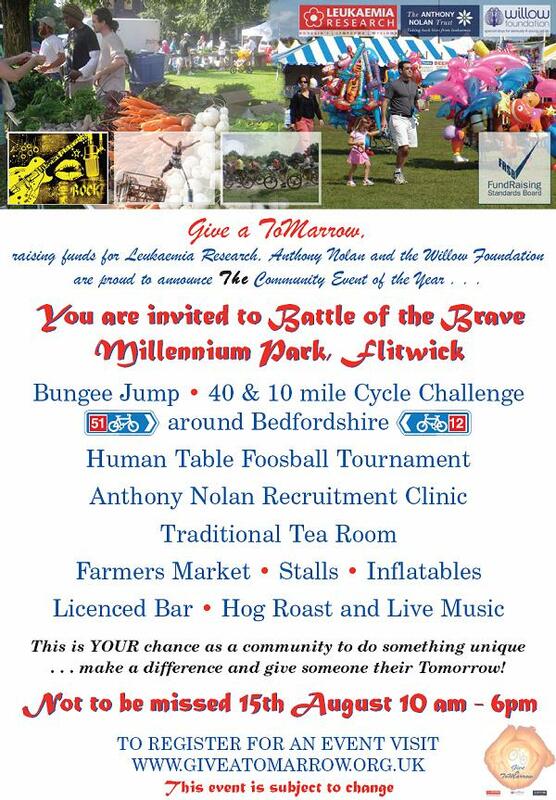 Give a ToMarrow, raising funds for Leukaemia Research, Anthony Nolan and the Willow Foundation are proud to announce Battle Of The Brave at Millenium Park, Flitwick, on 15th August from 10.00am to 6.00pm. The Players held another very successful review on 16th May. Called "Colour Me Happy" it featured the usual troupe of entertainers who entertained the enthusiastic audience with comedy, drama and song. Our thanks go to Val Trantum and her Team who prepared and served Supper. The event raised over £400 to help to buy new stage curtains for the Village Hall. The 2010 Pantomime is booked for Wednesday 20 January to Saturday 23 January. Put it in your diaries now. Eaton Bray made the trip to North Mymms on Sunday 17th May for their first ever nPower Village Cup tie. It was cold and windy with some rain about! Things began inauspiciously having arrived at 1.20pm to be advised the tie should of begun at 1pm. This despite North Mymms's advertising saying it was a 2pm start!! The Bray then won the toss and elected to bowl on a dry pitch (North Mymms's having decent covers!). A good bowling and fielding effort by the Bray saw regular wickets fall, eventually restricting Mymms to 180 all out from 35 overs. Gary Ellerton (fresh from 8-20 the day before) and Darren Kerins being the pick of the bowlers, both taking 3 wickets each. Gaz through his usual brisk pace and DK through his usual lack of it! 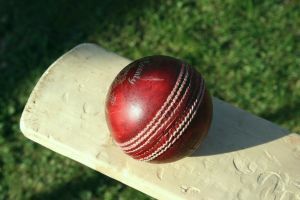 This proved to be the top of the Bray's performance however, as a combination of good bowling and dubious shot selection and a couple of "interesting" umpiring decisions found us bowled out for 69 inside 29 overs, only Chopper Harris offering any decent resistance with the bat, top scoring with 37!! North Mymms did employ the interesting tactic of utilising 4 spinners and 1 medium pacer. The team's feeling at the end of the game was our poor batting performance put the kybosh on what could of been a great win against the odds. We plan to try again next season, and hope for a slightly easier draw next time out. After being knocked out in the semi-finals two weeks ago in the Cranfield Colts tournament on penalties the Lions were determined to go one better this week in the Chiltern Junior Sevens tournament — and they did. After coming second in the group stages the Lions were up against Leighton Utd in the semifinal. After extra time the match was drawn and went to penalties. This week was different, penalty takers Darcy Ashby, Hattie French, Shannon Byrne, Megan Viljoen, Elsa Kirkwood and in goal Nancy Oliver (who made some great saves) did what was needed to send the Lions into the final. The opposition was Biggleswade, in a great match, and with defenders Katy Thiel, Eden Scott and Devon Ferguson keeping it tight at the back and Ashby, Hudson and Kirkwood controlling midfield it looked like the Lions were going to get a result. Strikers French and Viljoen pushed forward to try and score and then against the run of play Biggleswade scored and with only a couple of minutes remaining there wasn't enough time to get one back. The girls collected their medals and are looking forward to the presentation on Tuesday evening when they will collect another medal for finishing runners up in Division 1. Highlights from May's parish council meetings held on 6th May 2009, along with a downloadable copy of the full minutes are now available from the Parish Council website. Playing with the only six players who were available this week against seven, the Lions were always going to work hard to get a result, and that's just what they did. The Lions took control of the game from the start with only some good saves from the Brache keeper stopping the Lions from scoring, then after 14 minutes Dax Roe showed some good individual skills to put the Lions one up. Keeping the pressure on, it was only another five minutes and the Lions went two up from a forced error resulting in an own goal. In goal Toby Higgs had very little to do because of the work put in by defenders Ryan Luff and Jack Nevitt who were solid in defence. In what will be the last game for this team as they are unfortunately breaking up at the end of the season the Lions finished in style. After a slow start the Lions went 1 ahead after seven minutes with a goal from Oliver and then 5 minutes later after a well taken corner from Roe, Oliver got his second. With the Lions controlling midfield through Nevitt and Luff it was only a matter of time before the Lions got their third with a great finish from Roe. Then on the stroke of half time LBD scored on the break and it was 3-1. The Lions scored in the first minute of the second half after a good run by Quigley but a minute later LBD scored and it was 4-2. Two minutes from full time LBD made it 4-3 then a minute later Oliver got his third and the match ended 5-3 to the Lions. The Lions finished the season in 3rd place in Division 1 and were only three points off the top team. Congratulations and well done to all the boys, you did us proud. Thank you, Manager/Coach Key Roe and all the parents and supporters. In the Lions final match of the season the team were determined to win and finish the season Division 1 runners up. They did and they did it in style. Although the first half was tight the Lions had the majority of the possession and always threatened to score. By controlling midfield Ashby, Ferguson and Hudson ensured that the Lions kept Cranfield in their own half and when the Lions needed to defend Thiel and Scott dealt with anything they had to. The first half ended 0-0. As soon as the second started the Lions scored in the first minute when Viljoen tapped home a deflected shot. With the Lions keeping the pressure on it was only another six minutes before French scored and the Lions were two up. Substitutes Byrne and Kirkwood came on and helped keep the pressure on. Meanwhile, Oliver in goal made a great save from a hard shot at short range and again the Lions kept a clean sheet. With 12 minutes left French got her second and the Lions were on their way. Congratulations and well done to all of you from Manager/Coach Key Roe, coaches Tabitha, Sharon, Michelle and all parents and supporters. "March winds and April showers, bring forth May flowers." "Cast not a clout 'till May be out." "There are twelve months in all the year, as I hear many men say, But thy merriest month in all the year, is the merry month of May". "Let no man boast himself that he has got through the perils of winter 'till at least the 7th of May." Is England's Springtime, grown from England's rain". "Among the many buds proclaiming May, decking the fields in holiday array, Striving who shall surpass in braverie, Marke the faire flowering of the hawthorn tree, who finely clothed in a robe of white, fills full the wanton eye with May's delight." To me May is not only a spring month - it is the herald of summer. That long awaited time when hedgerows are a living green as new life flows into our countryside. The woods hive carpets of anemones and wood sorrel, and the bluebells reflect the skies. Bird song abounds, the buzz of bees and other insects can be heard. Nature is a timeless inspiration to artists, poets and composers. The artist can create a visual interpretation of his surroundings. The poet conjures a picture in rhyme. The composer notates his feelings in the sounds carried on the air. Man can wish or God can send". "As for us, our life is like grass, We grow and flourish like a wild flower; then the wind blows on it, and it is gone - no-one sees it again. But for those who honour the Lord, his love lasts forever." Dostoyevsky wrote a book entitled "The Brothers Karamazov", it contained this passage. "Love all God's creation, the whole and every grain of sand in it. Love every leaf, every ray of God's light. Love the animals, love the plants, everything. If you love everything, you will perceive the divine mystery in things." We have enjoyed making cards, pasta necklaces and fairy cakes for Mothers' day, and have held an Easter raffle to help raise some much needed extra funds. We are looking forward to lots more activities, and now that the summer is nearly here we hope to open up the hall doors and bring the outdoor toys into the sun! Our thanks this month go to Garden Scene Eaton Bray for providing us with our cress and mustard seeds which, by the time this goes to print, the children will have sown. We would also like to thank those who have “stepped” in to help whilst Louise rests her broken ankle! If you have not visited us yet, we are a friendly mother and toddler group, which meets each Wednesday during term time at 1pm in Eaton Bray village hall. No booking is required, just turn up! The hall is very spacious and bright with lovely views over the hills. It's a great place to let your child loose with painting, playdough and chalk, just the things that you may not want to do in your own home! You can even let us clear the mess up at the end! We charge £1.50 per adult, £1 per child over one and 50p per child under one. Tea and coffee is served at 1.45pm, when the children sit down for a drink and a biscuit. There is always singing to end the afternoon. Dates for your diary: On May 20th there will be biscuits to decorate, and on June 17th come along and make a card and stone paperweight for Fathers' day. Don't forget we will be closed on 27th May due to half term, reopening on 3rd June. Cheeky Monkeys is run by three volunteer parents, Sarah, Louise, and Sue. For enquiries please contact Sue Fox Fox on 01525 222387. We look forward to welcoming you. The theme of this year's Carnival on Saturday July 4th is Books which gives us all fantastic scope for dressing up and getting into the spirit of things. From 'Three Men in a Boat', through 'Ballet Shoes', 'Oliver Twist' and the 'Chronicles of Narnia', there's any number of themes to pick up on. Why not join in the Carnival Procession - it's not just for the younger element! Some of the most successful floats in recent years have come from local businesses such as Janes or The Bell PH. Alternatively, why not get your neighbours involved and enter a float in the procession manned by people in your road? Lack of a vehicle is no barrier -a 'walking float' is the green alternative. If you'd prefer to watch the Procession rather than be in it, don't forget our competition for the best dressed houses in Eaton Bray and Edlesborough, plus the best dressed business, with cups for the winners generously provided by Edlesborough Autos. Offers of help for the day before and Carnival day itself - manning a stand, setting up the stalls, clearing up, you name it, we can use your help! Whether you can spare just half an hour or the whole day, we'll be very glad of your help. Donations of supplies - we need plants for the plant stall, bottles of wine, cakes for the cake stall, old crockery for the plate-smashing - can you help? For any of the above please contact us via the Carnival website - www.stmarysvillagecarnival.com. We look forward to seeing you - in the procession or on the Green - on 4th July! A reminder that our Sunday School Anniversary will be celebrated on Sunday May 10th at 10.30 am with a Family Service led by Ann Pape with our young people. The following Saturday, May 16th our "Ten o' clock club" are holding a Coffee Morning from 10.00am until 12.00 noon in our School-room.There will be Cakes, Brica-Brac and Fancy Goods on sale and the proceeds are to be shared between Hearing Dogs for the Deaf and the Baby Scanner for the Luton & Dunstable Hospital, the groups current project. Please join us for our CREAM TEAS on Saturday June 6th in Great Billington. We can promise lots of fun for all the family, in beautiful surroundings, lots of stalls and scrumptious cream teas and plenty of car parking. All funds raised are for GAZA. How smart is your driving? Shift up the gears earlier (between 2000 and 2500rpm). Cruising comfortably in 5th gear is the best place to be. Cut your top speed. Wind resistance increases significantly with speed. The optimum speed for fuel efficiency is 45 - 50mph. Avoid unnecessary braking by anticipating the traffic ahead. Fluid motion is better than stop start. When slowing down, stay in gear and take your foot off the accelerator as early as possible. This reduces fuel consumption to near zero. Plan your route to avoid congestion or getting lost. Smarter driving could save you the equal of about one month's worth of fuel each year. For more money saving tips, contact the Energy Saving Trust on 0800 512 012. Did you realise that by 2016, the Government will expect that all new homes that are built will be zero carbon? In order for a house to be classed as being zero carbon, it will have to generate as much power as it uses over the course of a year. For most of us, the idea of having a home that generates enough power to meet its own requirements would appear as likely as the 50 pence litre of petrol. However, the zero carbon home is not a figment of imagination but became a step closer to mass reality with the first four-bedroom house being unveiled in Kent. The question that begs to be asked is how can we really achieve this? There is no doubt that meeting this objective will be expensive. In most cases, traditional building materials and construction techniques will not cut the metaphorical mustard and will have to be markedly improved. Where we site a house and how it is orientated will have to be considered. For example, there will be an expectation that new build properties will be orientated in such a way as to maximise space heating from the winter sun and shade from cold northerly winds. Following traditional street patterns may have to be jeopardised in favour of space heating orientation. Don't be surprised to find that those icy drafts synonymous with older properties will be consigned to history and instead, we can look forward to air tight rooms and entrance lobbies designed to reduce mass migration of heat. All very well but what do we do with the excessively flatulent dog in an airtight room? The fun doesn't stop there. We can look forward to motion detection lighting, which means it will only come on when areas within the home are actively populated and intelligent software to prioritise the use of appliances and stagger their use. Ways of physically generating renewable energy include the use of ground or air source heat pumps for hot water and space heating together with the use of biomass as a fuel. For the generation of electrical power, it is likely that in future, our roofscape will be populated by micro generating wind turbines and banks of gleaming photovoltaic cells adorned to roof planes. This will certainly have an impact upon the appearance of sensitive landscapes and conservation areas. Our local environment will determine what our buildings will look like. Zero Carbon will mean that road miles will be reduced in favour of using locally sourced materials. Moreover, we can look forward to harvesting our rainwater and recycling it through the use of reed bed technology for example. There is no doubt that the technology is there but in these times of economic belt tightening, can all those involved in the delivery of homes stomach the additional burden of meeting the zero carbon challenge? Does the idea of living in a draft proof room do it for you? We look forward to your comments. Back in the heady days of the early noughties, before spiv bankers brought the economy to its knees and the housing market to a standstill, the Government decided that the nation needed to build more houses. Not just a few but hundreds of thousands. One of the places it chose to site these was southern Bedfordshire - and in 2005 Luton, Dunstable, Houghton Regis and Leighton - Linslade were formally designated as a “Growth Area”. Around these towns the green belt would be rolled back to make room for an additional 41,700. The job of deciding exactly where these houses should be built was given to a new “Joint Committee” made up of councillors from Luton, South Bedfordshire and Bedfordshire County Council's. The committee assembled a team of professional planners and work on the new plan commenced. In June 2007 it was able to publish its first document for consultation - the “Core Strategy: Issues and Options” which explored various locations for the new houses. No less than 10 “options” were proposed, and, much to the surprise of many, some of the areas suggested for major new development were green belt villages outside the designated “growth area” - including Eaton Bray. Soon afterwards the collapse of Northern Rock heralded the end of cheap and plentiful credit and the housing market collapsed. House building ground to a halt. But the joint committee's work continued - albeit slowly. By the time this article appears in Focus it will have published its “Core Strategy : Preferred Options” document for consultation. This refines the ten options to one. It sidesteps the issue of precisely where new housing will be built - delegating this to a later document called the “Site Allocations DPD” - but it does identify general areas for growth. Eaton Bray is such a “rural settlement” and the Policy opens up the prospect of pressure for the release of land on the edge of the village, currently in the Green Belt, for new housing development. What “limited” means is not made clear. Views will vary about whether this would be a good or a bad thing, but the matter deserves to be the subject of local scrutiny and debate. The future of your village depends on it. The opportunity exists now to have your say, one way or the other, so don't miss it! This is the second of an occasional series on of articles on Town Planning issues. George Crutcher is a locally based Planning Consultant. The Police will be holding two Coffee Morning / Surgery events in the area where everyone is welcome to go along to discuss Problems & Grievances and get General Advice including about Crime Prevention. Full details are available in poster form in the Neighbourhood Policing section. In case you can't attend one, the police are happy to talk to Eaton Bray residents at the Totternhoe surgery as well as at the Eaton Bray surgery. 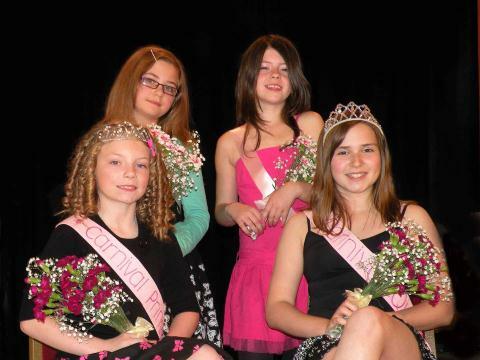 Charlotte Nilsen has been chosen to reign as Carnival Queen for the St Marys Village Carnival on Edlesborough Green on Saturday 4 July. Supporting her will be princess Shauna Lugsden assisted by Elise Christie and Rebecca Riley. The Carnival will be a celebration of the Best of Rural England and organisers hope to beat last year's record sum of £12,000 for local charities. This year's main beneficiary of the carnival funds will be the Neonatal Intensive Care Unit at Luton and Dunstable hospital which cares for premature and critically ill babies. It is the lead centre for neonatal care for the whole of Beds and Herts. The hospital is building a brand new NICU this year at a cost of £7 million to help meet the high level of demand . Money raised at the carnival will go towards the purchase of life saving medical equipment fo r the new expanded unit. Sarah Newby, Appeals and Fundraising Manager at the Hospital said: "We are delighted that the carnival has chosen to support our NICU Appeal this year. The new unit needs additional life saving equipment and we already care for 600 babies each year in the neonatal unit. We wish the carnival every success and please be assured that any money raised will help us by equipment to save even more precious lives." You are viewing the May 2009 archive.